The European Commission has acknowledged and respected, in Regulation 1/2003, the ability of the Member States to apply stricter rules than Article 82. There are some types of conduct that cannot be addressed by Article 82 because the undertakings involved are not dominant. One relates to conduct by non-dominant firms against other firms in weaker bargaining positions. A second type of conduct, and the focus of this book, relates to the anti-competitive conducts that non-dominant firms may adopt towards consumers (eg price discrimination, excessive pricing). This book focuses on instances where non-dominant firms have the ability to behave independently of customers and competitors and adopt conducts which will induce consumer harm. The Commission cannot address anti-competitive conduct of non-dominant firms which induce significant consumer harm. This has resulted from the application of the dominance concept and from the dependence of a finding of a dominant firm on the market share of the firm. The aim of this book is to illustrate that applying the concept of dominance in that way means that a non-dominant firm in a differentiated market can adopt anti-competitive conducts and not be deterred by the possible application of Article 82. 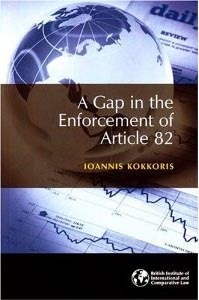 "A Gap in the Enforcement of Article 82"